3-feet in height. Available for rent. 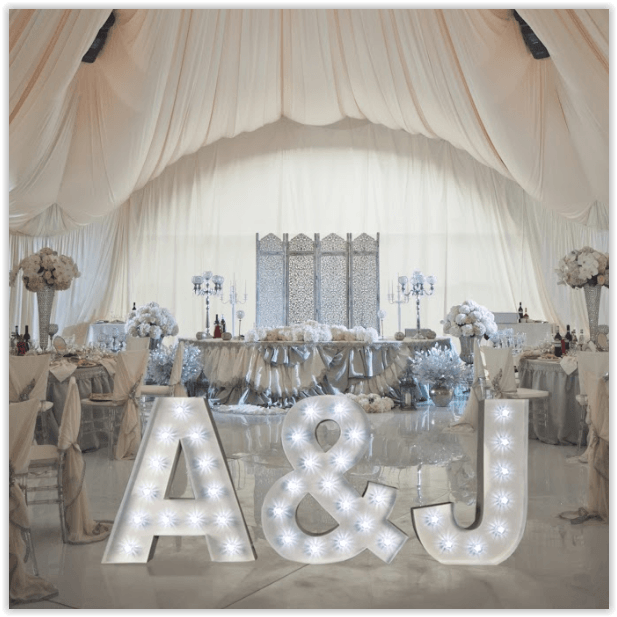 Add an unforgettable and timeless look to your next special event by renting giant marquee letters. 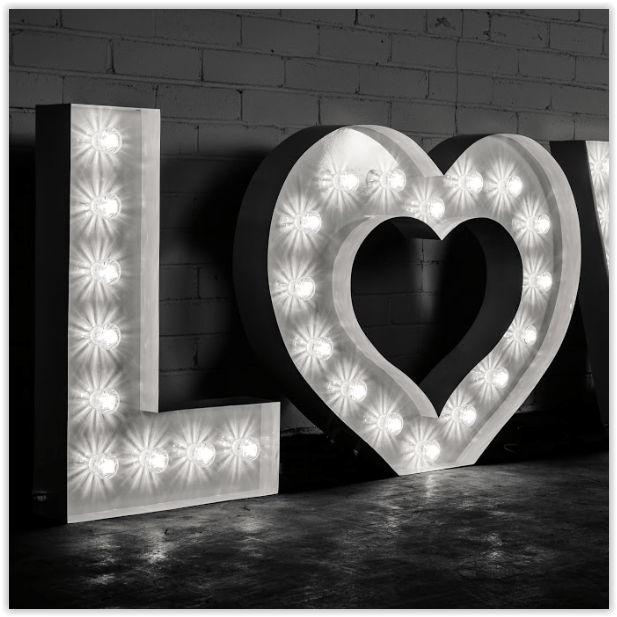 Powder coated timeless white, with super-bright turbo bulbs, our marquee letters are a guaranteed show-stopper. CLICK HERE or call (800) 450-1276 to book your marquee letters rental. We ship your marquee letters anywhere in the continental United States. Keep them for your event, we ship them back. Book here online or call our friendly scheduling staff at (800) 450-1276 to complete your rental. Our marquee letters are shipped and picked up at your event location for FREE. Our rentals are flexible with your events date and delivery or pick-up options. Some additional details to questions you might have. Each letter plugs into a standard US electrical outlet and can daisy chain with one another. No assembly. Simple remove the marquee letter from the box and plug it in. You keep our marquee letters for your event, we make sure the letters arrive and depart with no hassle. High quality construction, professional turbo-style LED lights. Our letters are one-of-a-kind. Free round trip shipping to and from your event location. 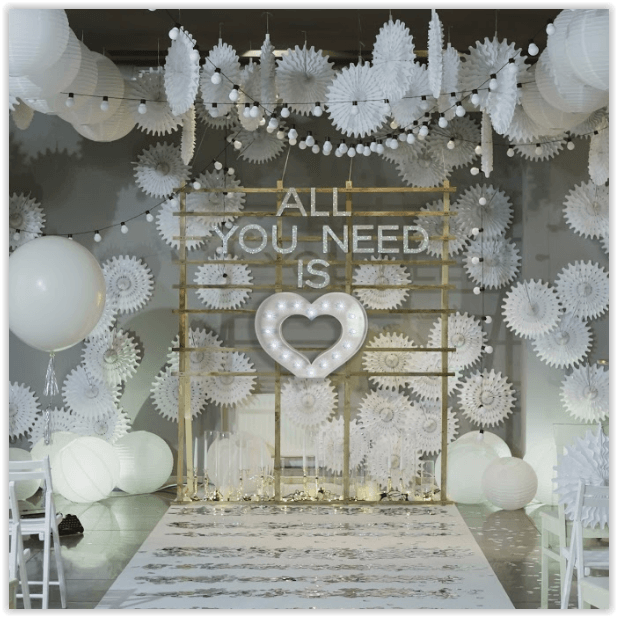 To rent 3 foot marquee letters and make your special occasion an unforgettable memory. Click to order or call today for availability. Make your wedding something to remember. Spell your names or initials, rent popular words like ‘love’ or ‘bar’, create a look of your own. Images that last a lifetime with our giant letters. Enhance your photo shoot and create an elegant marquee letter highlight with professional grade 3 foot marquee letters. Use your artistic spin with our marquee letters for your next photo shoot. How much does it cost to rent a letter? No. They can sit outdoors and are heavy enough to withstand wind. They are not waterproof and should not be exposed to water. How long can I rent the letters? Our standard rental time is 1 day. We do rent the letters for extended periods of time. Please contact us to inquire about extended rental fees. Do you sell the letters? We do run out of stock of certain letters. We highly advise to book your rental as soon as you have your event date to ensure your desired letters are secure. How big are the letters? Do all letters come with bulbs? All our letters and symbols come with white turbo bulbs. There is no need to ship additional bulbs as they are made of acrylic and therefore do not break. There is no option for letters to come without lights.